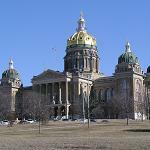 So, the leadership of the Iowa General Assembly are again hoping to end the session this week.Â From their standpoint, I think they hope to finish up the budget, pass the repeal of Federal Deductibility, and avoid any more discussion about a Marriage Amendment to the Iowa Constitution. It might be a bit of a challenge. The next three days, various groups will be descending on the Iowa Statehouse, and you can join them. Please dress warm.Â In case of rain, go inside the Capitol. and many more to be announced Monday. We need you to come to the Iowa Capitol on Tuesday, April 14, 2009 at 10:00am to make your voice heard.Â The Legislature will be in session all day and we need taxpayers to show up and say “No Tax on a Tax”. If you still have your red shirt and “No Tax on a Tax” buttons, please bring them along and wear them proudly. The bill to repeal federal deductibility and forces you to pay a tax on a tax, has a new amendment.Â House Democrat leaders filed the amendment on Wednesday in effort to improve House File 807, but is still bad for taxpayers. Governor Culver called the plan a $54 million tax cut.Â His description is clearly imaginative.Â The numbers provided by the Iowa Department of Revenue tell a different story. NET RESULTÂ Â $405.166 million TAX INCREASE for Iowans over the next five years. This new plan and the majority party’s explanation is similar to the story of a schoolyard bully.Â What Iowa kid would be happy with the following occurring? To make matters worse, in 2011 just over 149,000 Iowa taxpayers who earn $40,000 per year, or less, will see an increase in their Iowa income tax burden.Â Is that really the Democrat definition of a middle class tax cut?” Failor concluded. We can win this fight, but we need your help. So we need action from you, your family, your neighbors, and friends.Â If you can not join us at the Capitol, then please continue your phone calls, faxes, and emails. Thank you for all of your support and we look forward to seeing you on Tuesday, April 14, 2009 at 10:00am! Be prepared to have fun – it is going to be a hoot! With all of this distraction, it will be a wonder if the Legislature gets anything done.Â Â Personally, I hope they do get done… at least save us SOME money!